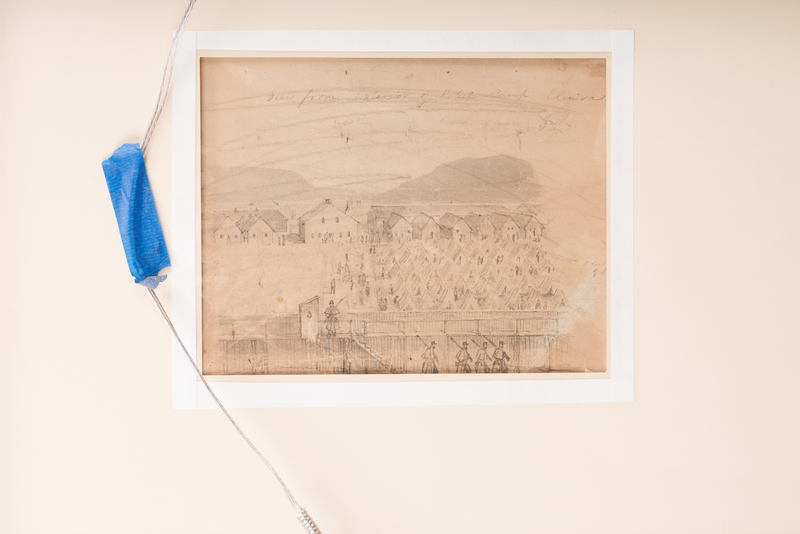 Two (2) Civil War prison sketches, one (1) letter, and one (1) book, 4 items total. 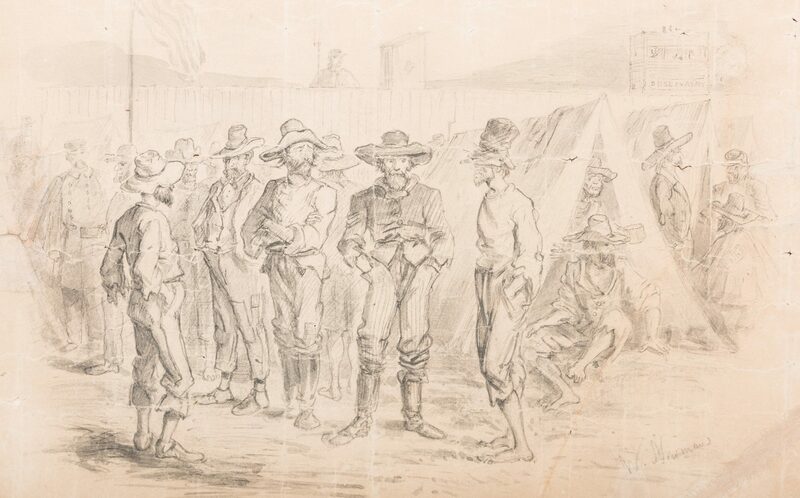 1st item: Graphite on paper sketch titled "Group of Rebel Prisoners" by W. Newman, a prisoner at Elmira Prison Camp; signed and dated September 10, 1864, lower right, inscribed to P. P Norman upper left. 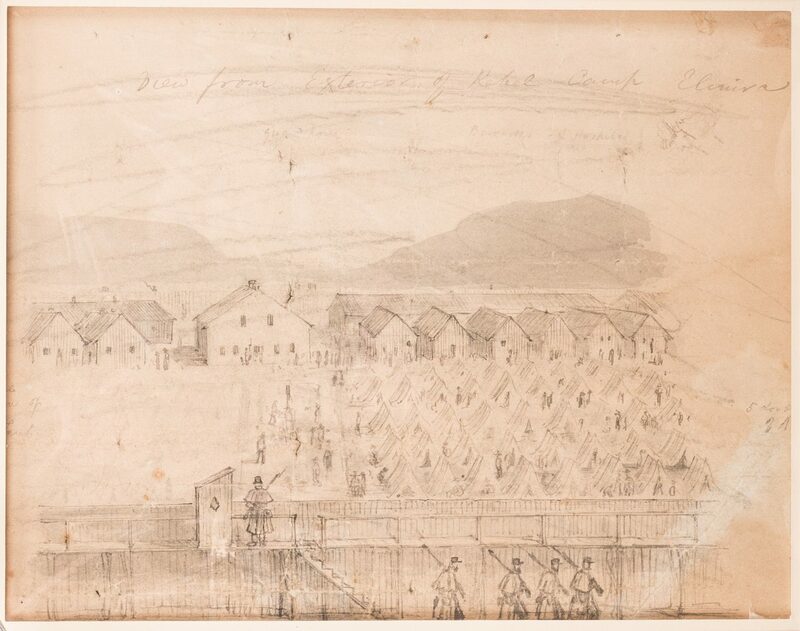 2nd item: Graphite on paper sketch titled "Views from Exterior of Rebel Camp, Elmira," also attributed to Newman. 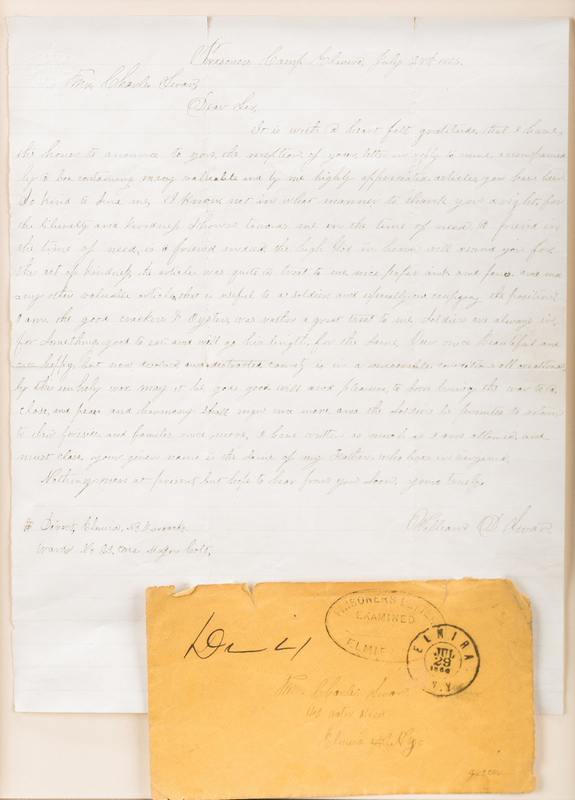 3rd item: Letter written from Elmira Prison Camp July 28, 1864, by William D. Swan to Mr. Charles Swan, 143 Water Street, Elmira, NY. 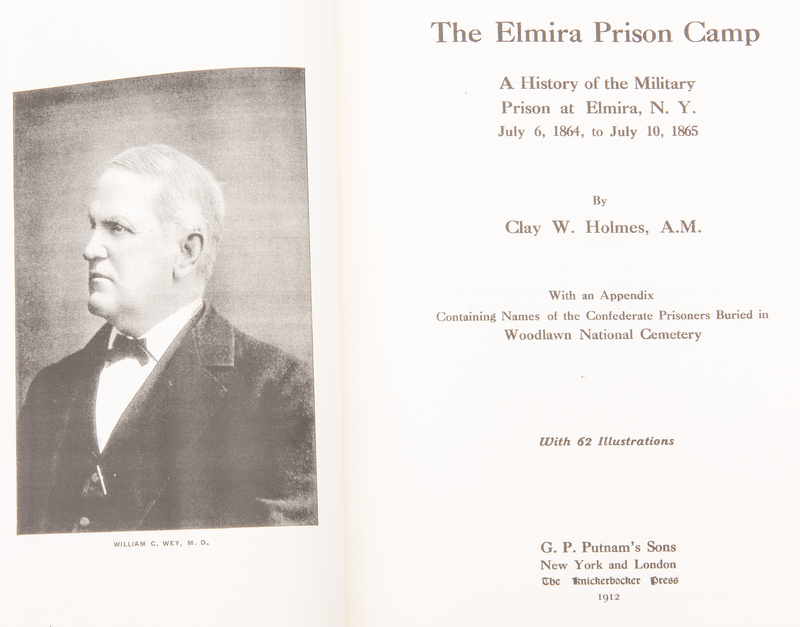 4th item: 2001 Reprint of the 1912 book "Elmira Prison Camp 1864-65" by Clay W. Holmes, in which the first sketch is published as Plate 19, p. 113. Ref. 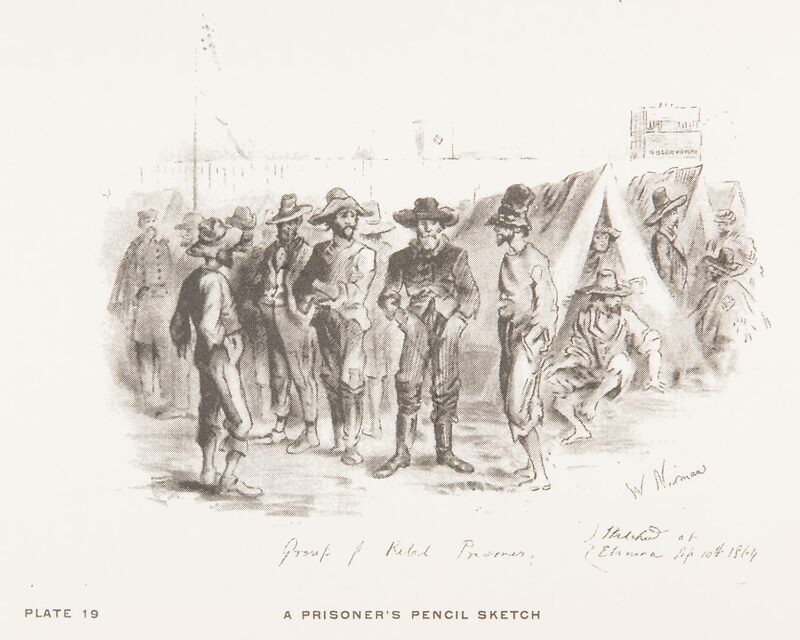 p. 76, and captioned "Reproduced from an original sketch made in the prison camp Sept. 10, 1864 by W. Newman, a prisoner, and presented to the late Prentice P. Newman…This sketch is an actual pen (sic) picture of the prisoners who stand in the foreground, exactly as they appeared at the time. 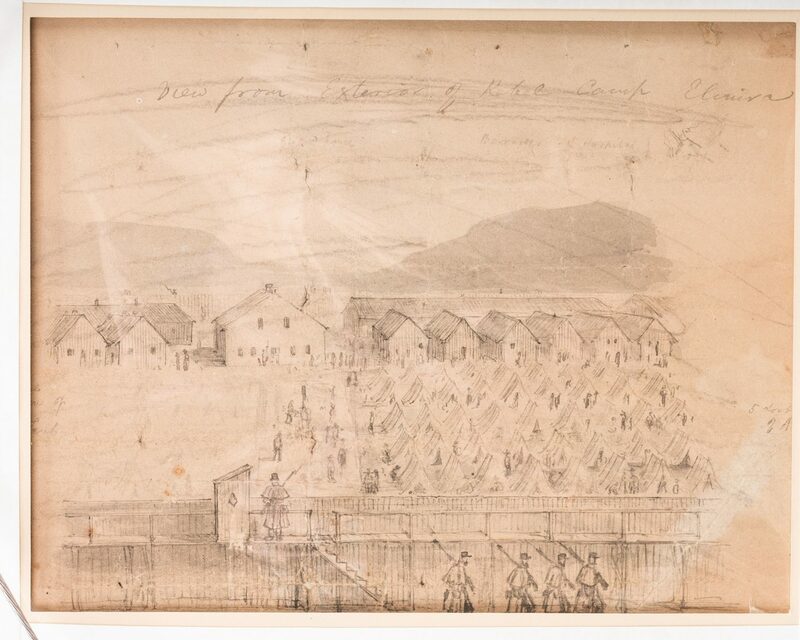 The stockade fence is shown and the 'Observatory' as it appeared to those inside the camp". 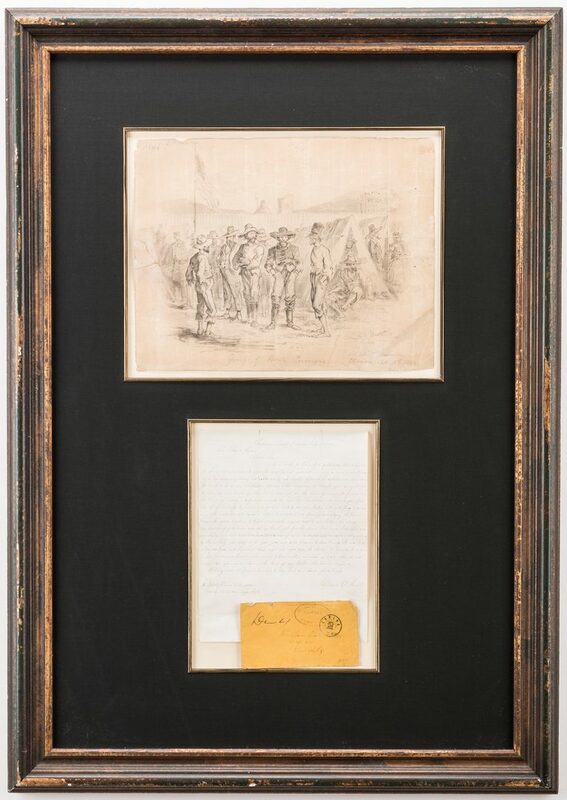 1st item – 10 1/2" H x 11 1/2" W. 2nd item – 7" H x 9" W. Letter – 10" H x 7 3/4" W. Archivally framed together in a new distressed giltwood frame, 36" H x 25" W, with black mat and glass window on the reverse to show second sketch. Note: Prentice Norman was the Postmaster Clerk at Elmira, and according to Holmes, "knew everyone by heart and was the only person in the office who could distribute mail". 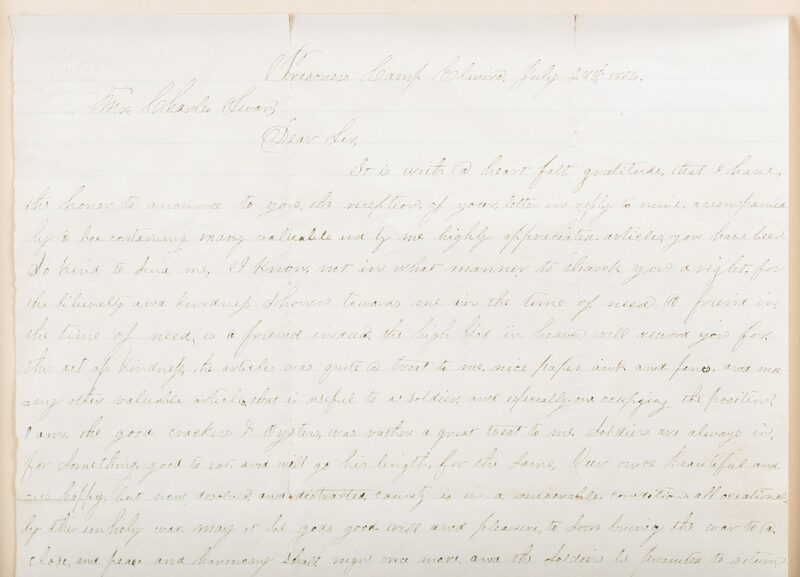 The text of the letter is as follows: "It is with a heartfelt gratitude that I have the honor to announce to you the reception of your letter in reply to mine, accompanied by a box containing many valuables by me highly appreciated, articles you have been so kind to send me. I know not in what manner to thank you…for the liberality and kindness shown towards me in the time of need. A friend in the time of need is a friend indeed. The high God in heaven will reward you for this act of kindness. The articles was quite a treat to me, nice paper ink and any other valuable articles that is useful to a soldier and especially one occupying the position I am in. The good crackers and oysters was rather a great treat to me. 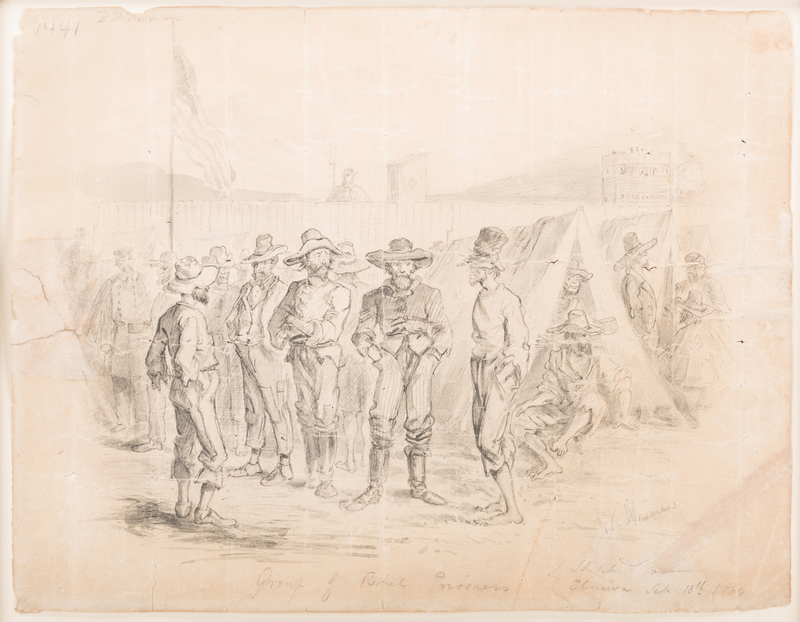 Soldiers are always in for something good to eat and will go his length for the same. Our once beautiful and once happy but now dissolved and distressed country is in a miserable condition all occasioned by this unholy war. 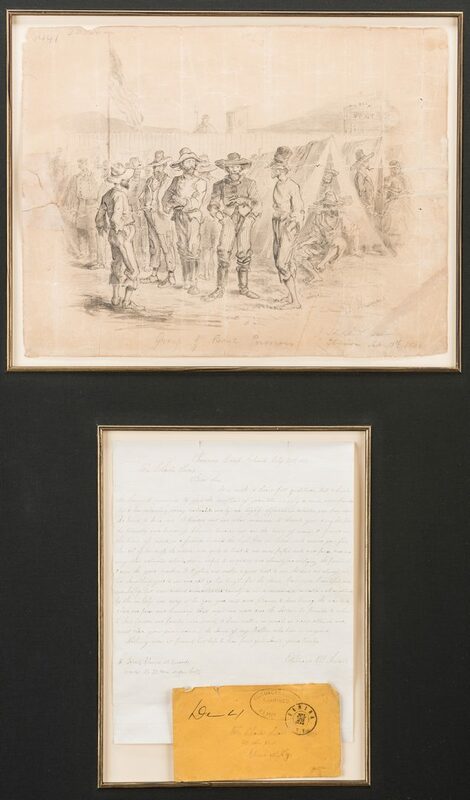 May it be God's good will and pleasure to soon bring the war to a close, and peace and harmony shall reign once more and the soldiers be permitted to return to their fireside and families once more. I have written as much as I am allowed and must close. Your given name is the same as my father who lives in Virginia. 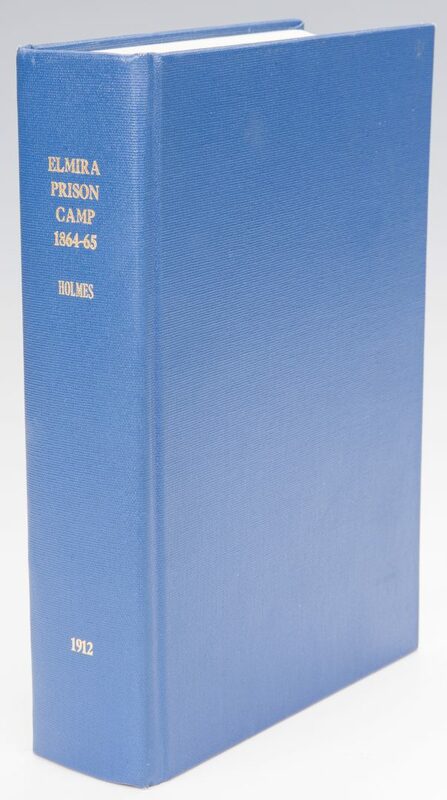 Nothing more at present but hope to hear from you soon. 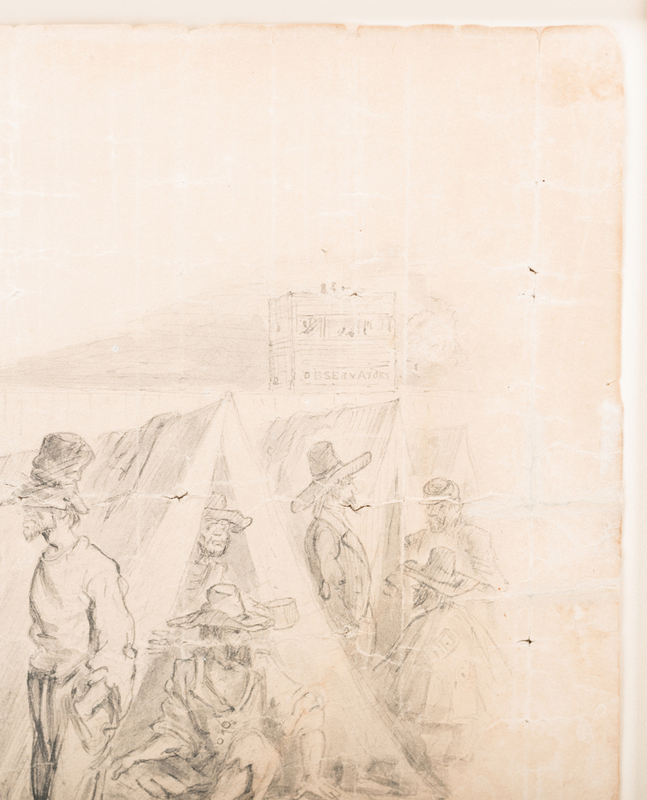 Yours truly, William D Swan". 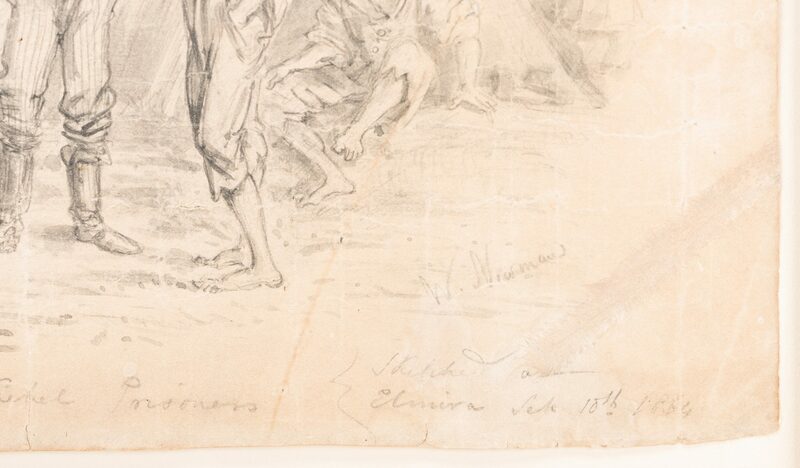 Provenance: Middle Tennessee collection, ex-Williams American Art, Nashville, TN CONDITION: 1st item: Toning and creasing with some possible small tears at edges, couple of tiny holes (1/4" largest). 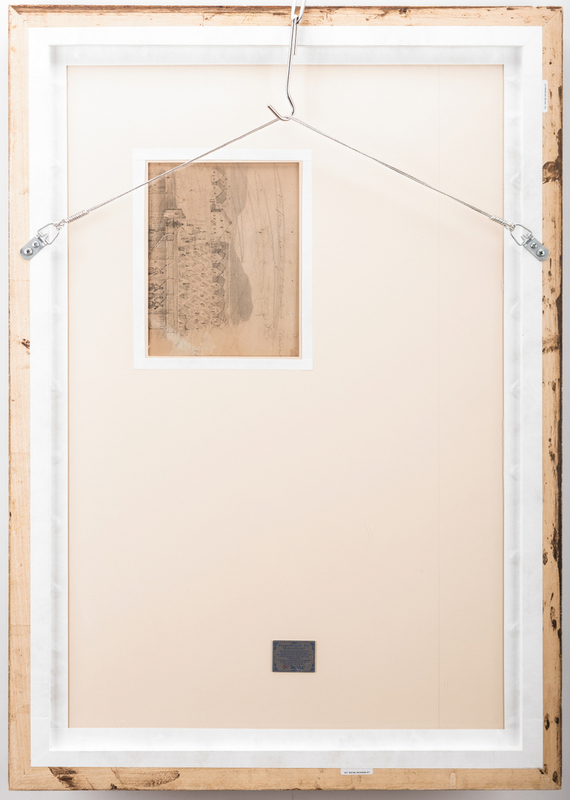 2nd item: Fold or possible repaired tear to lower right corner. 3rd item: Overall good condition with some minor separations at fold lines.